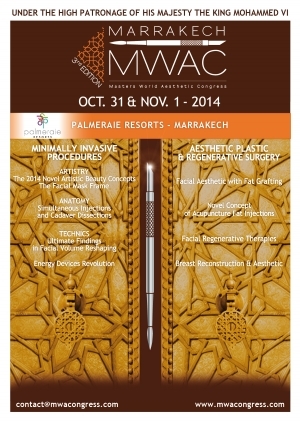 Dr. Sullivan Invited to Speak and Teach as Keynote at Master’s World Aesthetic Congress in Marrakech, Morocco - Patrick Sullivan, M.D. Dr. Sullivan has been invited to both speak and teach at this year’s Master’s World Aesthetic Congress held in Northern Africa, Marrakech, Morocco. Invited as a key note speaker, and co-chairman of three sessions, Dr. Sullivan looks forward to educating fellow plastic surgeons from around the world on his innovative fat grafting techniques. Dr. Sullivan has performed his fat grafting technique on over 1,000 adult patients as part of their facial rejuvenation surgeries. It was this work with cosmetic patients that initially led Dr. Sullivan to apply these same successful techniques to help assist less fortunate children struggling with the appearance of facial deformities. Dr. Sullivan has found that these sculpting procedures, which utilize the patient’s own fat and stem cells, can help to significantly improve the appearance of such facial deformities as: cleft lips and/or palates, craniofacial anomalies, reconstruction after tumor excisions, and disfiguring facial injuries. At the Master’s World Aesthetic Congress, Dr. Sullivan has been invited to speak on the art of fat grafting and utilization of fat grafting as a tool for treatment of cranio facial malformations. In addition, Dr. Sullivan will act as a co-chair on several plastic surgery panels including: facial volume enhancement with hyaluronic acid; artistic concepts and anatomy of the chin and jawline; and a discussion on the forehead, glabella, and nose. Dr. Sullivan is also honored that he has been asked to present the key note address on advances in fat grafting in children and adults with facial deformities. He looks forward to sharing his expertise on this subject matter as a means of educating surgeons from around the world and increasing access to plastic and reconstructive surgery for those less fortunate. For more information about Dr. Sullivan and his humanitarian work please visit www.drsullivan.com or contact our office at 401-831-8300.